R. Sadanandan, « Canvas of Memories, » in Sunday Times Plus, Colombo, 13 juin 2010. Back from Australia for an exhibition at the Barefoot Gallery, husband and wife duo Neville Weereratne and Sybil Keyt speak of life and art from the early days. They have both had the distinction of having exhibited with the '43 Group, way back in the 50's. 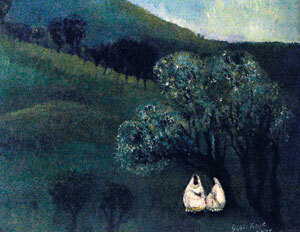 Life has been kind to Neville Weereratne and Sybil Keyt, for not only were their artistic talents spotted early in life and nurtured by some of the great names in the country's art history, they also have the good fortune, of now in retirement having the time and space to indulge in this fulfilling passion that has enriched their lives. They met, as fate would have it at the Cora Abraham art classes where Neville was then giving classes in life drawing. Sybil was one of the leading lights there, and though she hastens to add, that he never taught her, their paths inevitably meshed. They married in 1958 and though over the years Neville's work as a journalist and her own responsibilities in raising their family of four tended to overwhelm the artistic side, they never stopped painting and today as they prepare for another exhibition at the Barefoot Gallery, happily supervising the hanging of the pictures they have brought down from Australia, they are evidently well content. Their styles are certainly dissimilar, but there is an artistic feeding off each other when they work together in the studio they have in their home in Melbourne, says Sybil. Hers are oils that take in the landscapes around her, Australian, Indian or Lankan and she much prefers a smaller canvas, being drawn to figures, especially of women. They people her canvas, whether in a pastoral symphony or a bustling marketplace and you can sense the affinity she feels for them, these shrouded women in their flowing garments. Sybil's travels, especially those to the deserts of Rajasthan have had a marked influence on her work. “I love India, have a soft spot for it,” she confesses. Neville's work is all Sri Lankan. “I have always been deeply attached to Sri Lanka, its traditions, its people, its landscape, the culture. I took it with me. I draw on my memories of this, of my childhood, my youth,” he says. So in his paintings done in oils and gouache, you will find ordinary people, saffron robed monks, village women in redde hatte, their limbs strong, the landscapes almost Gauguin-like in their bold colouration and clearly defined focus. The '43 Group, that pre-eminent gathering of artists, George Keyt, Justin Daraniyagala, Ivan Peries, Harry Peiris, Geoffrey Beling, George Claessen, Aubrey Collette, LTP Manjusri and Richard Gabriel are those Neville knew intimately. His first book A Chronicle of Fifty Years in the Art of Sri Lanka, written shortly after retirement in 1989 was about the '43 Group and it is a source of some satisfaction that he was invited to exhibit with them when they held their major exhibition in London's Imperial Institute in 1952, along with other artists like Gamini Warnasuriya, Ashley Halpe and Ranjit Fernando, the latter who was responsible for putting this effort together. That exhibition, which he estimates, had some 100 pictures went on to Paris and to the Venice Biennale and had the effect of bringing this little known island to world attention, establishing beyond doubt, the value of their work. Before the '43 Group, he says going into some little known detail about its genesis, there was the Ceylon Society of Arts, formed by an ad-hoc collection of colonial executives' and planters' wives who painted in their leisure- vases of flowers and such like. “It became a club, a very closely monitored club. You had to submit your work for exhibition to be approved by a panel and if you didn't meet their approval you were out. Among the people whose work was thrown out were some very eminent Sri Lankan painters like George Keyt, Justin Daraniyagala, George Claessen, Ivan Peries. The only one who wasn't thrown out was Harry Peiris,” he says. Geoffrey Beling it was who spotted Sybil's early talent on seeing her drawing books during his annual visits as Inspector of Art in Schools. “You draw so well he told me,” says Sybil, remembering how much those early words of encouragement meant to her as a schoolgirl. He suggested she go to the Cora Abraham art classes and it was in this convivial atmosphere that she met with others like Ione Peris, Laki Senanayake, Noeline Fernando, Suren Wickremasinghe, Anil Gamini Jayasuriya, Coco Siriwardene, Sarath de Mel and Chandra Thenuwara, who later made up an enthusiastic, but informal group who met, discussed each other's work, calling themselves the Young Artists Group. Neville remembers too how Harry, who was secretary of the '43 Group collected the work of so many Sri Lankan artists, amassing over 800 pieces of work, paintings, drawings, sketches et al. 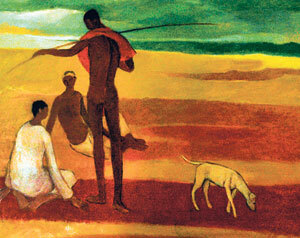 Before he died, Harry set up the Sapumal Foundation and left all these works to posterity, a great heritage of Lankan art. “Now why is it called the Sapumal Foundation,” asks Neville, with a twinkle in his eye. Sybil shakes her head and he reveals that Sapu is a flower that blossoms only partially and in his family, Harry seen as the one whom the rest felt never fully achieved his potential was nicknamed Sapumal. He saw the funny side of it in naming his trust, formed in 1974, the Sapumal Foundation. Neville's new book, just released, The Sapumal Foundation Collection a select catalogue of the works housed in this mellow house down Barnes Place relates these and other insights. Another of Neville's books Applause at the Wendt was written to celebrate 50 years of the Lionel Wendt theatre and here he pauses to digress into how he came to be drawn in by an old and dear friend Arthur Van Langenburg who was in Neville's reckoning an absolute wizard at stage craft and production. In the early days before the Wendt had been built, they worked at the King George's Hall of the University designing sets and Neville remembers the crazy rush as they toiled to get sets done through the night and sometimes took them on stage, paint still dripping. He makes no mention of his and Sybil's acting, though research on the Internet turns up more than a passing reference to their theatrical sides. After retirement too came more books on Richard Gabriel and George Beven, another singularly gifted artist, and one on Christopher Ondaatje's fine art collection. Though inclined to dismiss them as ‘an accident' the fact is that they were a natural progression from Neville's many years in active journalism. The newspaper days that started in his early 20's when after an early teaching stint at St. Peter's College, he was summoned by legendary Editor Denzil Peiris to work as an illustrator in his new Sinhala publications, the Janatha and the Silumina, soon took him to ‘subbing', an editing job on the Daily News where he went through sports stories, and then also did art reviews occasionally earning the ire of those whose work he wrote disparagingly of. Before moving to Australia where Sybil's family all were, he had a satisfying assignment working for the newly inaugurated Ceylon Tourist Board producing a quarterly magazine, newsletters and other promotional material and recalls being gifted a portfolio of photographs by famed photographer Henri Cartier-Bresson. “I wrote to him asking if we could buy the pictures he had taken during his stay in Ceylon and he very kindly wrote back giving us the entire lot. We reproduced them in the magazine and then after I left, they were in the library but I have no idea what has since become of them,” he says with some regret. In Australia too it was different journalistic assignments that sustained him, working at the Melbourne Sun, and finally ending up Editor of a Catholic journal The Advocate. Since retirement, they have both welcomed a period of artistic renaissance, punctuated by visits from grandchildren and now great grandchildren. It seems a productive time, for they have had regular exhibitions in Melbourne, opting recently for open studio showings at home. Their current exhibition at the Barefoot Gallery which opened on Friday will run until June 27.